SOLD OUT! We regret we have reached capacity for our Annual Holiday Party Please visit our event calendar and plan to attend our New Year Networking Mixer January 15 at the new offices of FastBreak Tech & Russell CPAs! 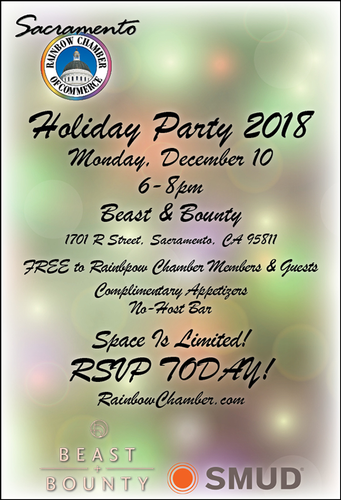 Celebrate the season with your Rainbow Chamber friends and colleagues at our Annual Holiday Party, hosted by hot new Sacramento eatery BEAST + BOUNTY and generously sponsored by our corporate partner SMUD! The Sacramento Rainbow Chamber of Commerce is hosting a Gift Card Drive for our neighbors displaced or damaged in the recent Northern California fires. If you would like to contribute, please bring gift cards in any denomination to our Annual Holiday Party! Gift cards from a variety of stores or credit card providers such as Visa will be accepted. Gift cards will be distributed to fire victims to buy what they need as they get settled into temporary housing or to pay for hotels, groceries, pet food, clothing and other daily necessities. The Sacramento Rainbow Chamber of Commerce and Rainbow Chamber Foundation kicked off the Gift Card Drive by contributing $1,000 each, a total $2,000. SOLD OUT! Please join us in January 2019! 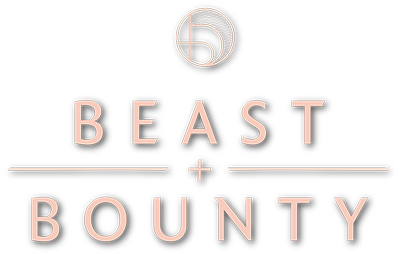 Thanks to our generous sponsor, SMUD, and host BEAST + BOUNTY!